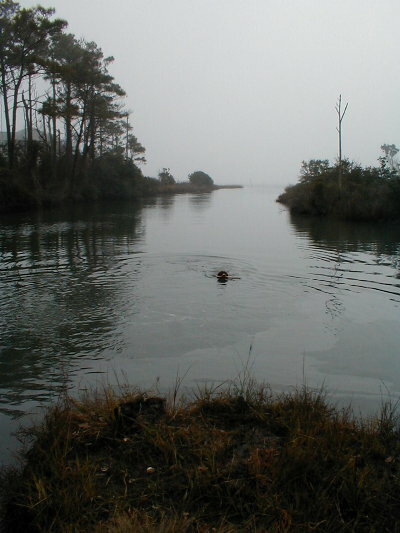 January 19, 2001 It looks like Brigadoon out at the Cherokee site, as the restoration facility looms in and out of the ocean fog. The weather has been mercifully mild this week, but wet, wet, wet. 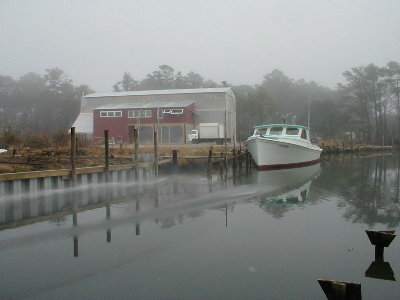 Overall, it’s proving to be a very cold winter, which has fishermen worried about the upcoming shrimp season. Freezing temperatures lead to few shrimp (bad) and few mosquitoes (good) come summer. But no matter what the weather brings, the Huckins crew rolls right along come rain, sleet, fog, or wind. 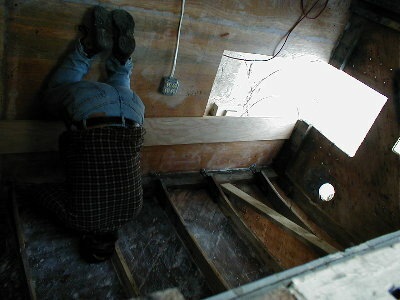 Bill Davis has been busy in the engine room, cleaning up the floor framing and prepping the area for engine placement. Meanwhile, “Wild Bill” Brown continues with his propulsion engineering. 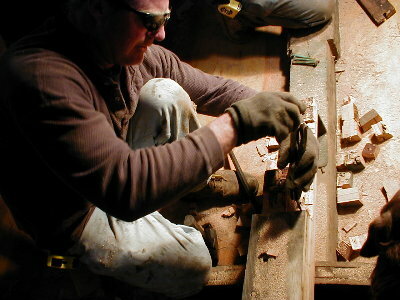 Two rough openings have been cut in the bottom and transom for the water jets. One of the crew was busy constructing a plywood mockup so that the water jets can be placed precisely where they need to be. Meditation Time? No, Upside Down Picture of Bill Davis! 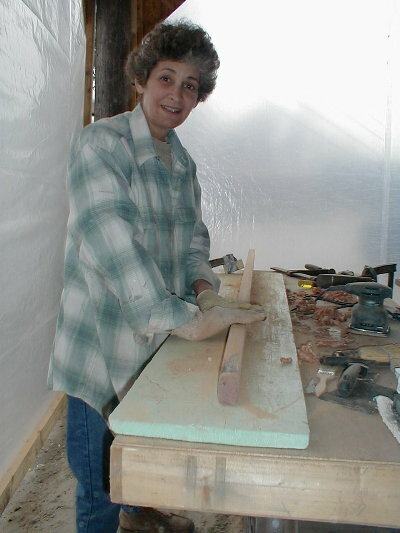 Jeanette also found a nice surprise from the past when removing a piece of shoe mold. 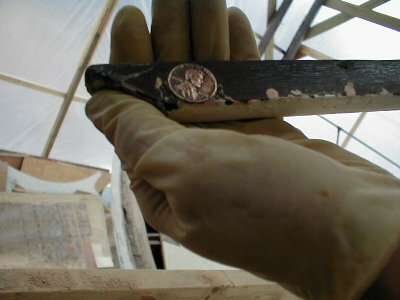 Glued beneath the mold was a 1958 class “d” penny. Whether placed there for fun or function is anybody’s guess. 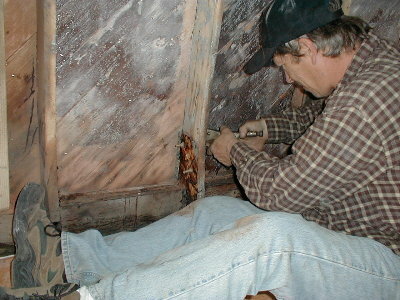 Tom and Leonard are deep in the process of splicing the keelson in the stateroom. A keelson is an internal keel in the form of a stringer. It’s bolted on to the keel to provide additional strength and to support the floors. 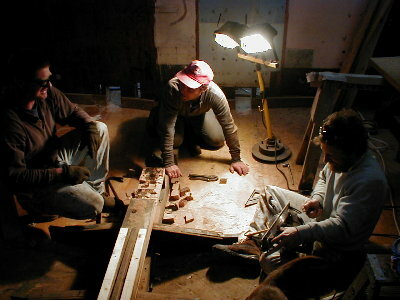 The crew is preparing the stateroom to accept an extension of the keelson through the engine room to the transom. Cherokee is shaping up to be one sturdy vessel.